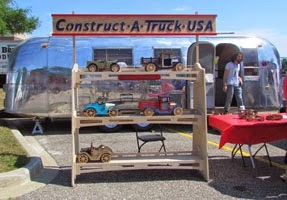 Jim Bustamante, founder of Construct A Truck USA and Trotec laser user, debuted his Construct A Truck USA Mobile Assembly Line trailer at the Detroit Maker Faire, July 26-27 in Dearborn, MI. The workshop was cleverly designed in a modified Air Stream trailer which was retro-fitted with shelving and a truck assembly line, allowing for the ideal working area for children (and children at heart) to assemble laser cut automobiles at parties and festivals. 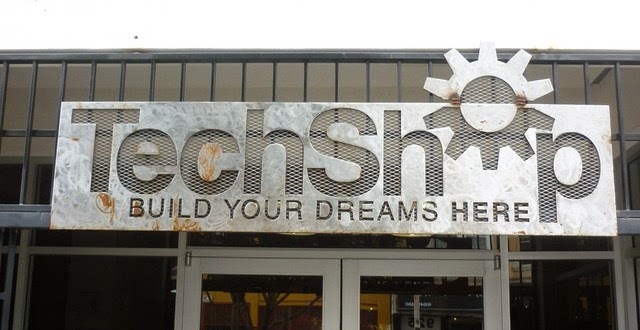 "We had about 100 trucks ready to be assembled in our trailer for the Maker Faire," said Jim. "Our Trotec laser was instrumental in making sure that we were prepared. We were running it over 10 hours a day, 6 days a week the month before the show." 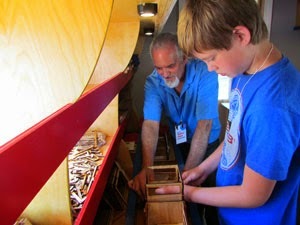 Jim knew that the kid-friendly audience of makers at the maker Faire was the perfect place to introduce his concept. Not only did he use the laser to create the parts of the trucks, but he also created various fixtures and fittings for his trailer on it as well. Jim came up with his idea for this after creating truck wine bottle holders at the local TechShop. "It was a big hit with the kids. All the adults thought it was really cute, but the kids couldn't stop playing with it. So I threw the bottle away and started making more trucks." After assessing his production needs, he knew that he would need a laser in his shop full time. "I chose Trotec because of the industrial grade quality of the machine and the CeramiCore laser source." Congratulations Jim and crew on a successful grand opening!